A 16-year-old boy was struck and killed by a vehicle early Saturday morning in Pine Township, Indiana County. Police in Shanango looking for driver of vehicle who hit pedestrian. Fatality, Ninth Street, downtown. Rather short on details. According to the Allegheny County Medical Examiner’s Office, the pedestrian was hit near the Blush night club on Ninth Street, Downtown. Police noted that he was jaywalking — 2:45 am, yeah, that’s a time you really have to pay attention to traffic. The speed limit on 9th is 25mph and a 25mph speed limit on city streets is intentionally chosen because of the pedestrian fatality differential between 25mph and 35mph. ie, that driver was grossly negligent in driving fast enough to kill someone from one light to the next. No charges will be filed, of course. Pedestrian fatally struck by vehicle in Bloomfield. The vehicle did not stop and the death was ruled an accident. A woman who was struck by a vehicle in Bloomfield early Sunday morning died the same day at UPMC Presbyterian, officials said. The Allegheny County medical examiner’s office identified the victim as Jessica McChesney, 26, of Wilkinsburg. The collision happened around 2:35 a.m. near the intersection of Baum Boulevard and Morewood Avenue, according to Pittsburgh public safety spokeswoman Sonya Toler. The vehicle did not stop and was believed to have been traveling outbound. There was no description of the vehicle. McChesney died of blunt impact injury to the head and neck., according to the medical examiner’s office. Her death was ruled an accident. Did you mean this sarcastically? When the bars close is when I most watch for traffic. I’m headed home right now. Believe me, I will treat each and every car I see as having a driver somewhere between too-drunk-to-walk and intoxicated-homicidal-road-rage. There is that getgo right on the corner there. Hopefully there were cameras rolling. I am also pretty sure that the cricket lounge on moorewood had a camera right outside of it. @mick, I agree. My point was, jaywalking had nothing to do with it. The pedestrian was undoubtedly killed by a drunk or inattentive driver. I never like the intersection of Baum Blvd and Morewood Ave, even though I have to go through it everyday. A lot of drivers use that intersection to turn left toward Oakland since it’s the only one with left turn signals. Also, it is an easy place to get onto Baum Blvd to access East Liberty and Highland Park from Oakland. In addition, there’s a Getgo at that corner, which makes the traffic volume even greater. What I find problematic is the vague right turn lane on Morewood Ave coming from Oakland. There are often cars parked in the lane, forcing cyclists to merge into the left one. 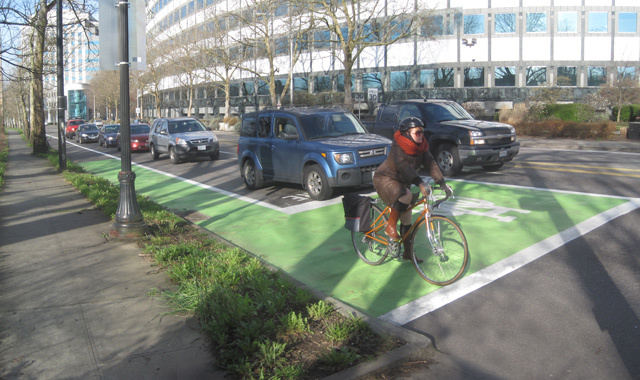 There are no restrictions on turning on red at the intersection, so impatient drivers often try to squeeze out cyclists. I’d recommend removing the parking space, installing a bike lane and “bike box” at the intersection, and put up a “no turn on red” sign. Looks like the GetGo cameras helped catch this guy quickly. It’s good that the police caught this murderer so quickly. How sad it is that this happened just before the “Mobility is Civil Right” townhall meeting tomorrow (6/30) This tragedy highlighted the need for infrastructures that curtail aggressive driving in the city. Given many nearby residents walk across Baum Blvd to get to GetGo, Chipotle, Giant Eagle, Aldi, and etc., I believe a road diet for Baum Blvd is needed. Shrink it down to two travel lanes and one turning lane. When: Thursday, June 30, 6:00 p.m.
Those interested in mobility/transportation issues, may also want to attend the Complete Streets Policy Public Meeting, on Thursday, July 7th at 6:00-8:00 p.m. at South Side Market House (1 Bedford Square, Pittsburgh, PA 15203). Complete Streets is the “simple concept that our public rights-of-way should be designed and maintained for all users, instead of just one type, the automobile” as described by Bike Pittsburgh. The incident also made the Associated Press. PITTSBURGH (AP) — A Pittsburgh transit bus hit a pedestrian who darted into traffic. Port Authority of Allegheny County spokesman Adam Brandolph says the incident happened about 1:40 p.m. Friday when a bus hit a pedestrian who ran into traffic in the city’s South Oakland neighborhood, near the Hot Metal Bridge. Brandolph says the pedestrian complained of shoulder and hip pain and had a cut on her head. She was taken to UPMC Presbyterian. I don’t know what a pedestrian was doing on the highway, but the fact that the driver did not stop is unacceptable. Pedestrian killed by car in Armstrong County, east of Kittanning. The article doesn’t ask why Hankey was out on that road in the early morning hours. Yeah, his car was black, too, so it might have been hard for her to see it. We all assume Hankey had his lights on. WPXI reported this morning that the baby and the babysitter/nanny in the lawrenceville accident were ok. No mention of a dog. They did say that the elderly driver will be evaluated to determine whether they will be permitted to keep their drivers license. Making left turns is aways challenging. A driver needs to watch out for incoming traffic, as well as both ends of the crosswalk for pedestrians. Many drivers failed to check the latter, and just dived through the corner. I’ve witnessed a near-miss due to this at the corner of Morewood and Baum on 8/26 this year. I think having a pedestrian all-walk phase for the traffic lights at the Morewood and Baum, as well as Butler and Stanton intersections will improve safety greatly. In addition, drivers need to learn from robots on how to control their speed when turning (see below). Better yet, replace all human drivers with robots! This reply was modified 2 years, 6 months ago by Gordon. According to the Westmoreland County coroner, the accident happened around 7:30 p.m. on Route 22 in Derry Township. Charlotte Anderson, 42, of Derry Township, was reportedly crossing Route 22 near the intersection when she was struck. Police haven’t released any information about the driver of the vehicle, or whether that person may face any citations or criminal charges. Critical piece of information missing: Which direction was the truck going. Eastbound, driver should not have had any trouble seeing. Westbound, might have had trouble seeing the pedestrian due to low sun angle. That’s an explanation, though not an excuse. I doubt that the direction of travel was critical. Several reports say that the crash occurred at approximately 7:20 PM, while sunset was 7:00 PM. Other info from the reports was probably more critical…..possibly crossing against the light………..wearing dark clothing (especially if crossing against the light). No, not me. I’m safely in my house. But this would be immediately north of where I exit the 12 McKnight. McCandless: 8700 block Babcock Blvd – Passenger exited Port Authority bus & struck by oncoming car; is being tended to by local EMS. I have no further details; just saw this on Twitter. Downtown Greensburg. Man trying to cross the street, trapped by traffic. Just found out about a ped killed in Aspinwall after getting off the bus. PennDOT road. This reply was modified 2 years, 3 months ago by erok. Person hit by two cars crossing Braddock at Sanders in Regent Square this evening. Sounds like only the second stopped. Both of these crashes are sad. For aspinwall there is little room for error when dropped off (or waiting for a bus) on the side of the street with the railroad tracks. There is no buffer between you and traffic. Just a few feet between the road and the waiting area. Trib typically uses accident, especially in their local papers. Any way to get this changed? I figured I’d go ahead and email someone at the Trib, but no idea how this gets passed down through their entire, far flung, organization.